I always like a bright kitchen with big windows. 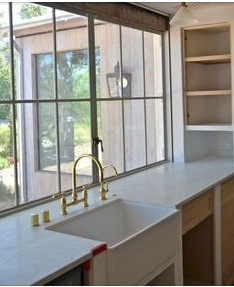 In these kitchens the window is right above the counter. It's a great look if you have the space for it. You sacrifice upper cabinets, but I think the window and natural light is well worth it! Washing the dishes in these sinks would't be so bad!